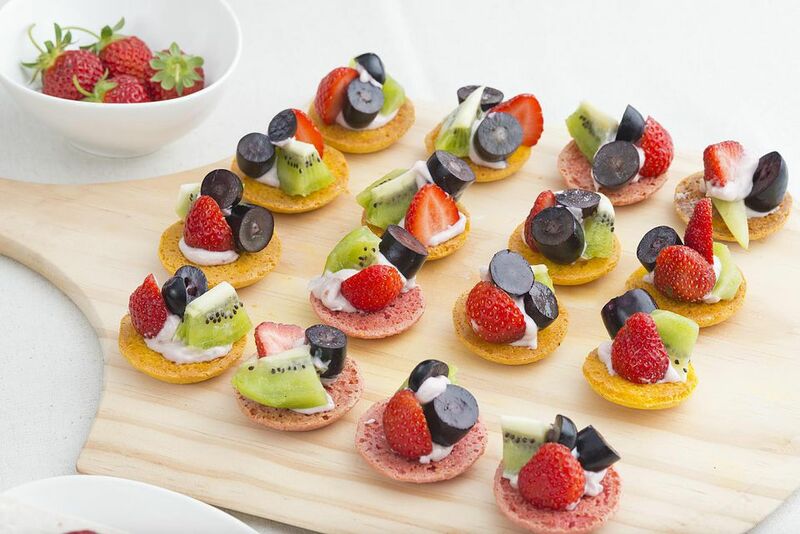 Glazed fruit tarts are a classic dessert found in many a cake shop. Sweet, buttery shortcrust tarts are filled with pastry cream and topped with strawberries, mandarin oranges, kiwi fruit, mango, blueberries, and raspberries. Shortcrust pastry has a reputation for being hard to work with due to its high butter content, which makes it a very soft dough. The trick is to chill it before working with it to harden the butter and make it easier to handle. Another tip with shortcrust is not to overwork it. Use a gentle touch and barely any kneading for a melt-in-your-mouth crumb. Note: While there are multiple steps to this recipe, this glazed fruit tart is broken down into workable categories to help you better plan for baking and assembly. Line a baking tray with plastic cling wrap. Set aside. Place 2 cups milk in a medium saucepan. Remove 2 tablespoons milk to a small container to be mixed with the cornstarch in step 2, below. Add the vanilla to the saucepan and warm milk gently over low heat. In a large bowl, whisk together 2 tablespoons reserved milk and cornstarch until smooth. Add 2 egg yolks and 2 ounces caster sugar, and whisk to combine. Add a little of the warmed milk and whisk. Add remaining warm milk to egg mixture, whisking constantly. Pour milk mixture from the bowl back into the saucepan and heat over medium heat, stirring constantly with a whisk or wooden spoon until the mixture thickens. This will take about 6 minutes or so. Stir the mixture well, especially in the edges of the saucepan. After the pastry cream has thickened, immediately pour it onto the plastic-lined baking tray and cover the surface with plastic cling wrap. This will stop a skin from forming. Refrigerate to cool until needed. Use your clean hands, or a mixer, to cream the butter together with 3 1/2 ounces caster sugar until it is smooth. Add 1 beaten egg and stir with a wooden spoon until combined. Place sifted flour on a clean work surface. Make a well in the middle and add the creamed butter-sugar mixture. Use your fingers to gently fold the flour in. Don't squash the mixture or use your palms. Just use your fingertips with a very light touch to bring the dough together. Roll dough into a large log, then divide it into 4 equal portions. Wrap individually with plastic cling wrap. Chill in the fridge for 20 minutes. Heat oven to 390 F (200 C). Lightly grease the 4 tart pans. Remove one portion of dough from the fridge and unwrap it. Place it on a piece of plastic wrap. Place another piece of plastic wrap on top of it and then roll in all directions with even, steady pressure to make a large circle about 1/2-inch thick. Make sure you roll the dough about 4 inches wider than the base of the tart pan. Work quickly so the dough doesn't get soft and hard to manage. Gently transfer the dough to the tart pan. This can be done by loosely folding the dough over the rolling pin then positioning it over the tart pan and slowly unfolding it. Ease the dough into the corners of the pan and use your fingertips to gently press the dough against the sides to fill in the fluting. To trim the overhang, just run your rolling pin over the top of the tin. If there are any holes in the dough, simply take a small piece from the overhang trimmings, moisten it lightly with water and position it over the hole. Press it gently into place. Repeat process with remaining dough. Next, use a fork to poke holes in the bottom of each pastry shell. This is called "docking" and helps prevent the dough from puffing up as it bakes. Line the pastry shells with parchment paper and add enough pie weights (uncooked rice or beans) to fill them to the brim. This is called blind baking. Bake the pastry for 12 to 15 minutes or until the edges pull away from the tin. Remove from oven and remove weights and baking paper. The center of the tart may still appear moist but this is fine. Set aside to cool. Make the apricot glaze by heating apricot jam and water together in a small saucepan. Stir well to melt. Strain and discard any pulp. Place liquid back in saucepan and heat gently for 5 minutes to thicken. Allow to cool slightly. Slice the strawberries, kiwi fruit, and mango into small pieces. The raspberries, blueberries and mandarin orange segments can be left whole. Fill the baked tart bases with pastry cream, spreading in an even layer. Arrange the fruit over the surface of the cream so that no pastry cream is visible. Dip pastry brush into the apricot glaze and lightly brush the surface of the fruit to give an attractive shine. Serve tarts immediately or cover and refrigerate for up to 12 hours.